Where do I use my Argento voucher code? Choose an offer from NetVoucherCodes and copy the code that’s provided. Follow our link to the Argento website and browse for your goods. Choose your items and click ‘Add to basket’. Paste the code you’ve copied from us in the ‘Please enter any Promotional or Gift Voucher Codes here’ box beneath your order and click ‘Add’. Your discount will be then be added to your order and you can click ‘Proceed to checkout’ to complete your purchase. "Huge savings in the offers section." "Free postage on all Pandora." "Up to 20% off your first order when you sign up to the newsletter." Established for more than 13 years, Argento specializes in bringing the best pieces of contemporary jewellery from around the world to their customers. In addition to selling top quality cutting edge jewellery designs, Argento is distributors for Pandora, Thomas Sabo, Pilgrim and other leading designer brands. Browse a wide selection of fashion and jewellery by top designers such as Antonio Ben Chimol! Argento offers a plethora of discount codes, sales and offers that can help you save money. All Argento's discount codes can be found above on our Argento deals page alongside great offers, deals and sales. Argento has big sales in all year round to help you find bargain deals. Browse their sale section and, where possible, use a code to save yourself, even more, money than you thought possible! Argento stock jewellery from huge brands in the industry including Pandora, Nomination, Olivia Burton, Vivienne Westwood, Michael Kors, Swarovski and more. With a great offers section and regular sales, you can find yourself saving a lot of money on products from each of these popular brands. Buy yourself or your loved one stunning jewellery including bracelets, charms, necklaces, rings, earring and watches. Whether it's the pastel colours and dainty nature of Olivia Burton watches, the glitz and glam of Micheal Kors, or the sentiment and style of Pandora- you can satisfy all your jewellery needs from huge brands-here, at Argento. Pandora Jewellery is popular with all ages mainly because of its timeless style, affordable nature and sentimental attributes. At Argento, you can shop from a variety of Pandora Jewellery including birthday, animal, fairytale, Christmas, glass, gold and lucky charms (naming just a few from their selection), as well as birthstone and other rings, pendants, earrings, clips, bracelets and more. You can shop via style, colour, material, size, length and collection to find the perfect piece of jewellery from Pandora. You have a 90 day period to return your items to Argento. For more information please check here. What is Argento's contact information? As one of the UK and Ireland's fastest growing online jewellery store. Use an Argento Promotional Codes to save on unique designer collections featuring luxurious brands fused with all the high streets hottest styles! 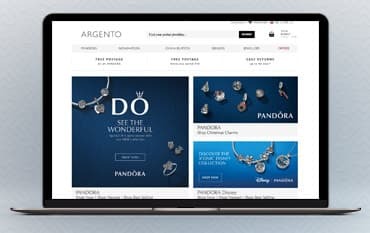 Argento is even the single biggest Pandora retailer and is expanding every single day. Travelling the globe far and wide for only the highest quality, most diverse, new and innovative materials, Argento work closely with their suppliers to bring you something special, something you will love, at even better prices!